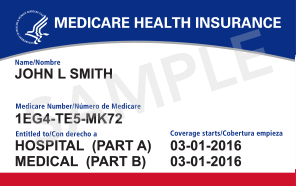 The federal government is issuing new Medicare cards to all Medicare beneficiaries. To prevent fraud and fight identity theft, the new cards will no longer have beneficiaries' Social Security numbers on them. The Centers for Medicare and Medicaid Services (CMS) is replacing each beneficiary's Social Security number with a unique identification number, called a Medicare Beneficiary Identifier (MBI). Each MBI will consist of a combination of 11 randomly generated numbers and upper case letters. The characters are "non-intelligent," which means they don't have any hidden or special meaning. The MBI is confidential like the Social Security number and should be kept similarly private. The CMS will begin mailing the cards in April 2018 in phases based on the state the beneficiary lives in. The new cards should be completely distributed by April 2019. If your mailing address is not up to date, call 800-772-1213, visit www.ssa.gov, or go to a local Social Security office to update it. threatening to cancel your insurance if you don't give out your card number. There is no cost for the new cards. It is important to know that Medicare will never call, email or visit you unless you ask them to, nor will they ask you for money or for your Medicare number. If you receive any calls that seem suspicious, don't give out any personal information and hang up. You should call 1-800-MEDICARE to report the activity or you can contact your local Senior Medicare Patrol (SMP). To contact your SMP, call 877-808-2468 or visit www.smpresource.org. For more information about the new cards, click here and here.